Introduction: Most studies of drowning in Bangladeshi populations to date have described mortality and trends. We sought to identify associations between socioeconomic status and child-care practices and nonfatal drowning in rural Bangladeshi children. Materials and Methods: This community-based case-control study was conducted in rural children aged 1-5 years in Raiganj subdistrict of Bangladesh. 122 cases and 134 age-matched controls were recruited and their mothers were interviewed by use of a structured questionnaire. Univariate analyses and logistic regression were done to analyse the data. Results: Child nonfatal drowning was significantly associated with mothers: With low educational status (P < 0.001), of younger age (P < 0.005), of single status (P < 0.001) and with more than three children (P < 0.001). Nonfatal drowning was 12 and five times more likely in children of illiterate mothers than in children of mothers with academic knowledge equivalent to sixth to tenth grade (OR [95% CI] 0.08 [0.02-0.26]) and above tenth grade (OR [95% CI] 0.21 [0.04-0.95]) (P < 0.001), respectively. Low socioeconomic status, indicated by lower family expenditure (P < 0.001) and no house (P < 0.05; OR [95% CI] 0.58 [0.17-0.99]), were found to be risk factors for childhood nonfatal drowning. Improved child care, as measured by a child-care index, was associated with significantly lower non-fatal drowning (P < 0.001). Child care improved with higher educational attainment of mothers (P < 0.005) and increased socioeconomic status. Nonfatal drowning was more common when the main caregiver was not the mother (P < 0.001). Forward likelihood ratio logistic regression indicated mothers' lower educational status as the best predictor of nonfatal drowning. Conclusion: Better child care and prevention of nonfatal drowning might be ensured through increasing mothers' educational attainment and improvements in socioeconomic status. Most previous studies of drowning in Bangladeshi populations are descriptions of mortality and trends. [17-19] As in other developing counties, child drowning in Bangladesh may be influenced by sociodemographic and economic factors but evidence to date is lacking. To inform appropriate prevention programmes, an understanding of these various risk factors is essential. The aim of this study was to identify the contributing factors to nonfatal drowning of children in Bangladesh. The study was approved by the Ethical Committee of the National Institute of Preventive and Social Medicine, Bangladesh. The purpose of the research was explained to mothers of the cases and controls, the mothers then gave verbal informed consent. This community-based case-control study was undertaken in Raiganj subdistrict of Sirajganj district of Bangladesh, an area characterized by rivers, ponds and ditches. Raiganj covers 267.83 km 2 and in 2006 had a population of 225 028, of which 50.9% were male. The average literacy rate is 21.8% and the main occupation is in agriculture. The Centre for Injury Prevention and Research, Bangladesh (CIPRB), a national nongovernmental organization has an injury surveillance system in this area, which collects all fatal and nonfatal child injury data from community and healthcare centres. Within this surveillance database, we identified 160 cases of children aged 1-5 years with at least one experience of nonfatal drowning that were registered between January 2010 and April 2011. Of these, 134 children could be located at the time of exposure-data collection and were therefore included as cases. A similar number of controls - children who had not experienced drowning - matched for age with cases' ages at the time of near-fatal drowning were purposively recruited from adjacent villages. 12 cases were excluded because data were incomplete, thus 122 cases and 134 controls were included in the final analysis. Data analyses were done with SPSS version 17. Descriptive statistics were computed to compare the distribution of sociodemographic and exposure variables between cases and controls. χ² -test or Student's t-test were done to test differences in categorical and continuous variables between the cases and controls. The variables that showed significant associations in these analyses were included in the binary logistic regression models to identify risk factors after adjusting for other variables. Crude and adjusted odds ratios (OR) with 95% confidence intervals (CIs) were calculated. Forward likelihood ratio (LR) logistic regression analysis was done to identify the best predictor of nonfatal drowning. Most participants were Muslims. However, nonMuslims (all were Hindus, only one Buddhist) were more common in controls (32.8%) than in cases (15.6%), (P < 0.001; OR [95% CI] 0.38 [0.20-0.69]). [Table 1] shows the parents' characteristics. Mothers of cases were, on average, 2 years younger than the mothers of controls (27.18 ± 4.41 versus 29.28 ± 5.04 years; P < 0.001). Younger mothers (<25 years) were more common for cases (41.8%) than for controls (25.4%). OR indicated that cases were 5, 7 and 50 times less likely to have mothers aged 25-29 years (OR [95% CI] 0.20 [0.08-0.51]) 30-34 years (0.13 [0.05-0.32]) and ≥ 35 years (0.02 [0.00-0.10]), respectively, than the controls. Children of widowed or separated mothers were nine times more likely to have experienced nonfatal drowning than children of married mothers (OR [95% CI] 9.21 2.28-37.16). Mothers of the controls had fewer (one or two) children (69.4%) than mothers of cases (37.7%; P < 0.001; OR [95% CI] 19.58 [6.56-58.39). Parental education showed significant association with nonfatal drowning in univariate analyses but, after accounting for other sociodemographic variables, the influence of fathers' education disappeared. 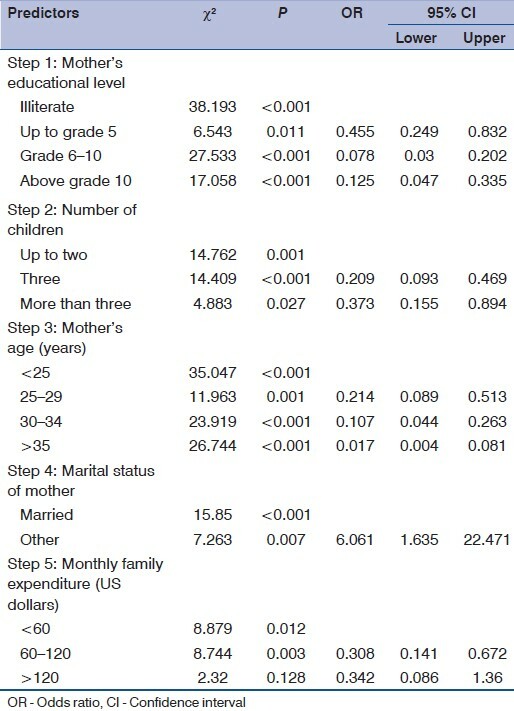 The association of mothers' education remained significant (P < 0.001). Nonfatal drowning was 12 and 5 times more likely to be experienced by children of illiterate mothers than the children of mothers having academic knowledge equivalent to 6 th to 10 th grade (OR [95% CI] 0.08 [0.02-0.26]) and above 10 th grade (OR [95% CI] 0.21 [0.04-0.95]) (P < 0.001), respectively. The majority of mothers of both cases (84.3%) and controls (77.0%) were housewives (P > 0.05). Fathers' occupations also did not vary between cases and controls. Data were collected on some household characteristics to assess the economic status such as family expenditure, house construction materials, house ownership, land and source of drinking-water; these are presented in [Table 2]. On average, the monthly family expenditure of controls was about US$30 higher than that of the cases (P < 0.001). The proportion of landlessness was almost half in controls (35.1%) than that in cases (66.4%, P < 0.001) but there was no difference after accounting for other variables. Children who experienced nonfatal drowning were two times less likely to be a member of a family owning a house than controls (P < 0.05, OR with 95% CI 0.58 [0.17-0.99]). Floors, walls or roofs made of mud, hay or straw were categorized as kacha (not made of concrete) and were more common in houses of cases than those of controls (P < 0.001). Cases' families more commonly had no latrine (i.e. they used others' facilities or an open field) than those of controls (P < 0.001). 80% of controls had their own water sources, which was significantly higher than cases (63.1%, P < 0.005). The overall housing standard, taking construction material of the dwelling and ownership of water source as criteria, was poorer in cases (91.0%) than in controls (73.9%). After adjusting for sociodemographic variables, the relationship between nonfatal drowning and economic variables did not persist although influence of monthly expenditure and house ownership remained significant. Care practices for the study children were assessed by observing the attendants [Table 3] and constructing the CCI. Mothers were the main caregivers but this figure was 12% lower in cases (86%) than in controls (98%, P < 0.001). Crude OR suggested that nonfatal drowning was seven times more likely to occur while the main caregiver was other than the mother. When other socioeconomic variables were considered, this association disappeared. Mothers were asked about who used to look after the child when they were busy. Among cases, 38.5% children remained unattended, which was higher than in controls (25.4%, P < 0.05). Crude OR suggested a doubling of risk of nonfatal drowning in unattended children when mothers' were busy with their work but, after correcting for socioeconomic variables, the influence did not persist. Cases (75%) more commonly went outside to play than the controls (66%) and more than half of them were accompanied by only their playmates. 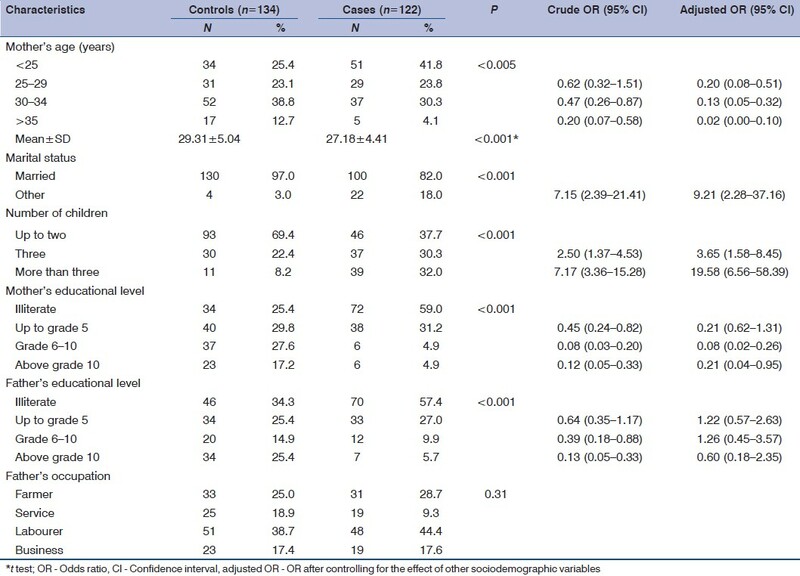 This difference between cases and controls was not significant [Table 3]. The minimum CCI score was 3 and maximum 16 on a scale of 0-22, with higher scores reflecting better care. 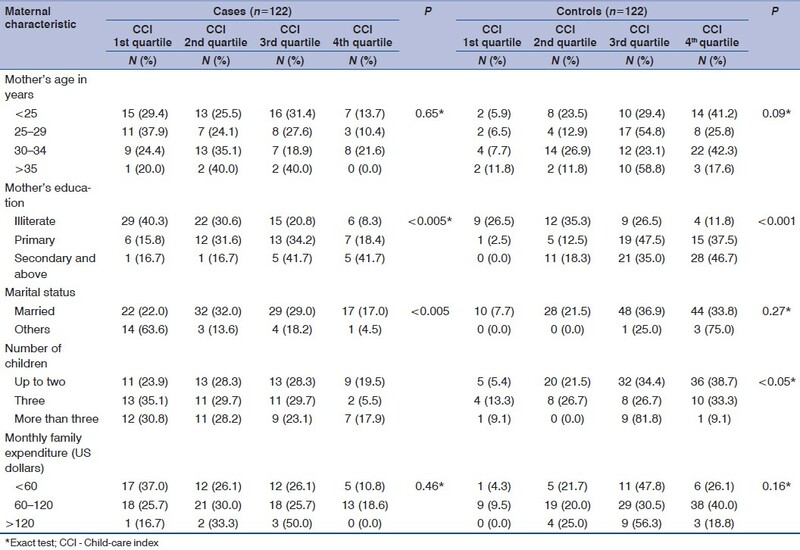 The CCI score was divided into quartiles and compared between cases and controls [Table 4]. Cases had significantly poorer care index scores than controls (P < 0.001). Adjusted OR revealed that, compared with first and second quartile, cases were three and five times less likely to have care score in the third (OR with 95% CI 0.30 [0.09-0.98]) and fourth quartile (OR with 95% CI 0.22 [0.06-0.83]), respectively, than controls. Data on the influence of socioeconomic characteristics on child care were analysed in cases and controls and are shown in [Table 5]. Maternal age showed no influence on child care in either cases or controls, whereas maternal education was associated with child care in both cases (P < 0.001) and controls (P < 0.001). With an increase in the mother's educational attainment, the level of care increased. Improved child care was associated with marital status of the mother in cases (P < 0.005) and with the number of children in controls (P < 0.05). CCI was lowest (65% in first quartile) in single mothers. Monthly family expenditure had no influence in either group. Forward LR logistic regression analysis was done with all significant exposure variables to identify the best predictor of nonfatal drowning [Table 6]. Mothers' education was the best predictor followed by number of children and mother's age. The model also included marital status and family expenditure as important predictors. The full model was statistically highly significant (P < 0.001) and 53% of the variation in dependent variables could be explained by the independent variables (Nagelkerke R2 = 0.527). 80% of cases and 83% of controls (overall 82%) could be correctly classified by the model. The final model excluded house ownership and the CCI from the equation. Most previous studies have been descriptions of drowning mortality and trends; ,[21-23] no population-based studies have characterized nonfatal drowning or explored the risk factors in Bangladesh. This community-based case-control study provided the opportunity to fill this gap in the published data. The small sample size and recall bias may have influenced our results. We aimed to reduce recall bias by keeping the reference period as short as possible. The proportion of Hindus, in both cases and controls, were clearly higher than the national data. Moreover, the percentage was double in controls than in cases. No religious culture is known to influence drowning that might have selection bias and the effect of religion was removed by logistic regression modelling in further analyses. Data showed that with an increase in parental educational level, especially maternal education, nonfatal drowning rate significantly decreased. Forward LR logistic regression identified maternal education as the best predictor. Educated mothers are more aware of child-care factors and this study also showed that educational status of the mother significantly influenced the level of child care. A study  in Saudi Arabia showed that the mothers' level of education had a positive impact on her child healthcare knowledge and ability. The findings are consistent with a study  in India, which showed that educated mothers increased concern about child health issues was linked to a lower rate of child accidents. Children of widows, divorced or separated mothers were more at risk (18%) than in controls (3%, P < 0.001). Single mothers are likely to be busier earning a living in addition to routine household work, making children in this group at increased risk of nonfatal drowning. Families with three or more children were 3.6 and 19.6 times, respectively, more likely to have nonfatal drowning than those with only one or two children (P < 0.001). A higher number of children may divide parents' attention, exposing them to unintentional injuries such as nonfatal drowning. A study in India showed that the number of siblings is a contributing factor to child injury risk. Similar results were observed in the Bangladesh Health and Injury Survey  and in China. Proper family planning might increase the ability to supervise children and thus reduce the risk of injury. Our analyses suggest that low socioeconomic status is associated with a higher risk of nonfatal drowning. 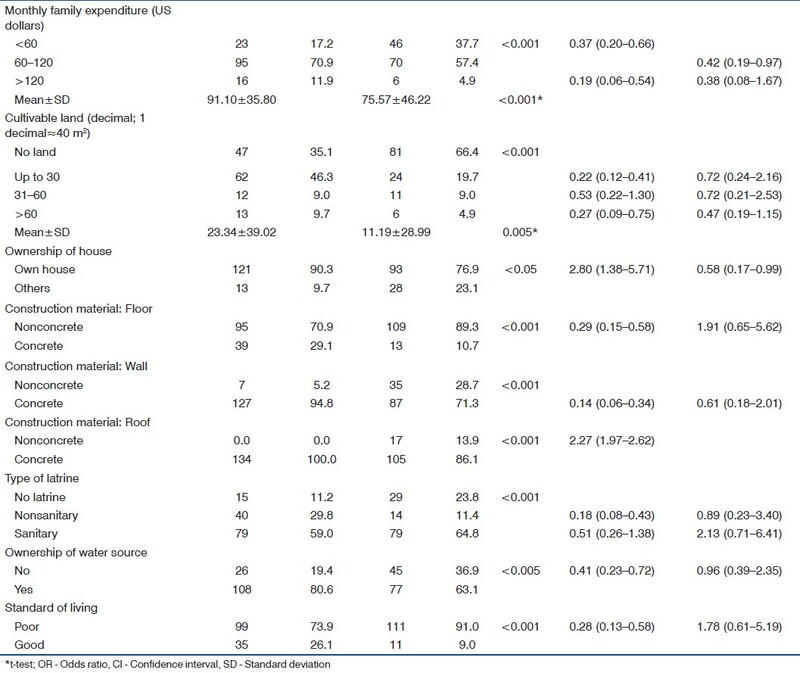 Children of families with a monthly expenditure of more than US$60 were 2.4 times more likely to experience nonfatal drowning than those of families with a monthly expenditure of more than this amount (P < 0.001; adjusted OR [95% CI] 0.42[0.19-0.97]). Similar findings were reported in a previous study in rural Bangladesh,  the Bangladesh Health and Injury Survey  and studies from China. ,, The finding that children of families living in a kacha house (i.e. with a floor, wall and roof made of mud, hay, etc.) were more at risk (P < 0.001) has been reported by others. However, when other variables were adjusted in our analyses, the influence of house constructions disappeared. Our study also showed that nonfatal drowning was about twice as likely to occur in families with no house than the families with their own home (P < 0.005, adjusted OR [95% CI] 0.58 [0.17-0.99]). Thus, better socioeconomic status reduced the risk of nonfatal drowning. Previous studies , have also indicated that better socioeconomic conditions allow parents to provide better care for their children including improved safety measures that reduce the occurrence of nonfatal drowning. By contrast, monthly family expenditure did not show an association with the CCI and thus sociodemographic factors may not influence the occurrence of nonfatal drowning. In addition, in the logistic regression model, after controlling for other variables, the influence of socioeconomic status disappeared. The role of adult supervision in the prevention of child drowning has been emphasized by many researchers. For example, Laden and Quan  found that drowning typically involved a supervision standard violation. It is important to consider the interaction between the type of supervisor, supervision pattern and level, child and environment. Some researchers suggest that older siblings as supervisors increase the risk of injury. The Bangladesh Health and Injury Survey  included a case-control study to determine the risk factors associated with drowning. In 16.7% of the child-drowning cases, the main attendant was not the mother; in controls, this figure was only 2.4%. Similar findings have been reported from Australia. Our data are in accord with these earlier studies. When the main caregiver was occupied with household work, 38.5% of cases were unattended and 25.4% of controls (P < 0.05, OR [95% CI] 0.54 [0.32-0.92]). Parents and caregivers mistakenly believe that a younger child can safely play or be in the care of older children. In this study, when the main caregiver was anyone other than mother, there was a significant association with nonfatal drowning, although this finding did not persist after controlling for other variables. A study in India revealed mother's supervision to be a contributing factor in reducing nonfatal drowning. It is probably the unique caring attitude of mother who knows best how to protect her child from injury. In this study, lower quartile CCI showed significant association with nonfatal drowning, which is consistent with other studies. Studies in China, ,, the USA, , India  Australia  and Bangladesh , have shown that good child care is the key factor in prevention of child drowning. It is likely that families that provide better child care possess a greater overall sense of responsibility and therefore their children are at a lower risk of nonfatal drowning. Child care is clearly influenced by maternal education and better child care prevents drowning. Furthermore, in our analysis, low maternal education was the best predictor of nonfatal drowning. Improvements in woman's educational status through increasing literacy might therefore have a role in the prevention of nonfatal drowning in children. Improvement in overall economic status through poverty alleviation activities might also help reduce nonfatal child drowning in Bangladesh. 1. Rahman A, Giashuddin SM, Svanström L, Rahman F. Drowning-a major but neglected child health problem in rural Bangladesh: Implications for low-income countries. Int J Inj Contr Saf Promot 2006;13:101-5. 2. Yu M, Gong W, Han X, Hu R. An analysis on the cause of injury death in Zhejiang Province, 1999-2001. Zhejiang Prev Med 2004;16:3-5. 3. Ma WJ, Xu YJ, Zhang YR. The study on death pattern and burden of disease in Guangdong province, China, Guangzhou. The economic press of Guangdong province; 2008. 4. Liu J, Qu H. Analysis on drowning among children under 5 years in Nanjing during 1996-2000. Jiangsu Health Care 2001;3:14-5. 5. Moon RE, Long RJ. Drowning and Near-drowning. Emerg Med 2002;14:377-86. 6. Wintemute GJ, Kraus JF, Teret SP, Wright M. Drowning in childhood and adolescence: A population-based study. Am J Public Health 1987;77:830-2. 7. Patetta MJ, Biddinger PW. Characteristics of drowning deaths in North Carolina. Public Health Report 1988;103:406-11. 8. van Beeck EF, Branche CM, Szpilman D, Modell JH, Bierens JJ. A new definition of drowning: Towards documentation and prevention of a global public health problem. Bull World Health Organ 2005;83:853-6. 9. Ma WJ, Nie SP, Xu HF, Xu YJ, Song XL, Guo QZ, et al. An analysis of risk factors of non-fatal drowning among children in rural areas of Guangdong Province, China: A case-control study. BMC Public Health 2010;10:156. 10. Wintemute GJ. Childhood drowning and near-drowning in the United States. Am J Dis Child 1990;144:663-9. 11. Press E, Walker J, Crawford I. An interstate drowning study. Am J Public Health 2007;58:2275-89. 12. Ahmed MK, Rahman M, van Ginneken J. Epidemiology of child death due to drowning in Matlab. Int J Epidemiol 1999;28:306-11. 13. National drowning report, 2007. Available from: http://oyallifesaving.com.au//resources/documents/2007_Final_Version_Drowning_Report_eb_Version [Last accessed on 2012 June 15]. 14. Yang L, Nong Q. Risk factors for childhood drowning in rural regions of a developing country: A case-control study. Inj Prev 2007;13:178-82. 15. Rahman A, Mashreky SR, Chowdhury SM, Giashuddin MS, Uhaa IJ, Shafinaz S, et al. Analysis of the childhood fatal drowning situation in Bangladesh: Exploring prevention measures for low income countries. Inj Prev 2009;15:75-9. 16. Iqbal A, Shirin T, Ahmed T, Ahmed S, Islam N, Sobhan A, et al. Childhood mortality due to drowning in rural matlab of Bangladesh: Magnitude of the problem and proposed solutions. J Health Popul Nutr 2007;25:370-6. 17. Rahman A, Rahman F, Shafinaz S, Linnan M. Bangladesh Health and Injury Survey: Report on children: January. 2005;5:49-56. 18. Pitt WR, Balanda KP. Childhood drowning and near drowning in Brisbane: The contribution of domestic pools. Med J Aust 1991;154:661-5. 19. Fergusson DM, Horwood LJ. Risks of drowning in fenced and unfenced domestic swimming pools. N Z Med J 1984;97:777-9. 20. Armar-Klemesu M, Ruel MT, Maxwell DG, Levin CE. Poor maternal schooling is the main constraint to good child care practices in Accra. J Nutr 2000;130:1597-607. 21. Gilchrist J, Gotsch K, Ryan G. Non-fatal and fatal drowning in recreational water settings-United States, 2001-2002. JAMA 2007;292:164-6. 22. Silva DT, Ruben AR, Wronski I, Stronach P, Woods M. Excessive rates of childhood mortality in the northern territory, 1985-94. J Paediatr Child Health 1998;34:63-84. 23. Zhao Z, Svanström L. Injury status and perspectives on developing community safety promotion in China. Health Promot Int 2003;18:247-53. 24. Al-Ayed IH. Mothers› knowledge of child health matters: Are we doing enough? J Family Community Med 2010;17:22-8. 25. Subbiah N. Knowledge of mothers on prevention of childhood accidents-a study with particular reference to selected area of New Delhi. Nurs J India 2006;97:229-31. 26. Bose A, George K, Joseph A. Drowning in childhood: A population based study. Indian Pediatr 2000;37:80-3. 27. Brenner RA, Trumble AC, Smith GS. Where children drown, United States, 1995. Pediatrics 2001;108:85-9. 28. Centre for Disease Control and Prevention. MMWR weekly. Nonfatal and fatal drowning in recreational water settings, United States, 2001-2002. 2004;53:447-52. 29. Brenner RA, Salvia G, Smith GS. Swimming lessons, swimming ability, and the risk of drowning. Inj Control Saf Promot 2003;10:211-6. 30. Mackie IJ. Patterns of drowning in Australia, 1992-1997. Med J Aust 1999;171:587-90.